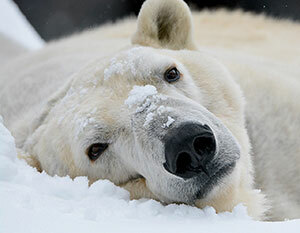 We are saddened to announce the passing of Zero, the 26-year-old male polar bear born here in 1989, and transferring to the Seneca Park Zoo in NY in 2010. Based on necropsy findings, the provisional diagnosis for Zero’s disorder is lymphoma, a form of cancer. Histopathology results will be available in 6 weeks. Photos courtesy of the Seneca Park Zoo. 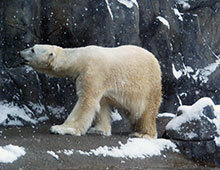 Zero was transferred to Seneca Park where he joined Aurora, a female polar bear also born in 1989. While he didn’t produce any offspring, Zero’s contribution to the field of assisted reproduction strategies will support the future of the Polar Bear Species Survival Plan® (SSP), a management program that maintains a healthy and sustainable population of species in conservation care. While residing at both the Milwaukee County Zoo and the Seneca Park Zoo, Zero served to educate countless visitors on the importance of conserving this precious species. He will not be forgotten.